The director of the Department of Education says student achievement is at the forefront of the good things in state education — and also the things that need work. Judy Jeffrey issued gave her annual "Condition of Education" report to the State Board of Education Wednesday. Jeffrey says the thing they’re most proud is "the achievement of our students and the increased number of students who’re actually proficient." She says they’re making gains in achievement gaps among Hispanic, African Americans and students in poor economic conditions. But Jefferey says the improvement is only a start. She says they still have the challenges to meet the achievement gaps, and there are still students who struggle. Jeffrey says they have to improve instruction and expectations of students, and see more students taking challenging course and advanced placement (A-P) courses. She says they’re "on a road for improvement, but not where we would like to be." Jefferey says their goal is to increase the amount of required courses students must take to graduate. Jeffrey says they do want to change the instructional strategies of some of the teachers, and change the expectations of students to go beyond just reading and mathematics achievement. She says that’s much broader than the federal plan for education, but says Iowa has always been a leader in education. Jeffrey says the state will need more resources to better train teachers. Jeffrey says as they change the expectations for what they believe what students really can achieve, that will take a different kind of teaching and learning, different kinds of student products, different kinds of student assessment in the classroom, which will all take more training and resources. "This isn’t an easy road we’re charted on, but I think it is the best road for our students,"Jeffrey says. Jeffrey says the increased training and pay for teachers is important in a time when statistics show fewer people are looking at the profession. "Last year, we had, even in our elementary preparation programs, we had 500 fewer students interest in teaching. This is a national dilemma that we are not respecting the teaching profession," Jeffrey says, "and even though I think most teachers don’t enter the teaching profession to get rich, I do think they expert a reward from their students and a respect from the parents for the job that they do." 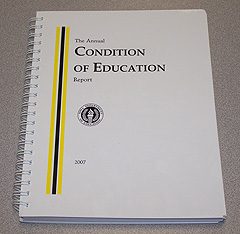 You can see Jeffrey’s entire report on the Iowa Department of Education’s website.